A television news reporter is assaulted by a stalker and is left traumatized. She is invited to a therapeutic retreat by her doctor, who may have sinister intentions for inviting her there. The year 1981 offered moviegoers a showdown of films featuring werewolves. One could even say it was the year of the werewolf. The most notable from that year is, of course, John Landis' classic "An American Werewolf in London." Another werewolf flick from that year is "Wolfen," directed by Michael Wadleigh. Before either of those titles hit theaters, in April of 1981, Joe Dante released his werewolf feature called "The Howling." The film stars Dee Wallace as TV reporter Karen White, who has been convinced by police to act as bait in order to catch wanted serial killer Eddie Quist, played by Robert Picardo. The killer has made contact with her numerous times, so she is asked to meet him in an adult video store where Quist makes contact right before police gun him down. This leaves Karen a bit traumatized, understandably so. Her doctor George Waggner, played by Patrick Macnee, recommends she and her husband visit his seaside retreat where he attends to many other patients. At first, this retreat seems like a therapy group full of decent people, but as time passes, they start to realize not everyone is exactly what they seem, and that many of Dr. Waggner's patients may actually be lycanthropes. 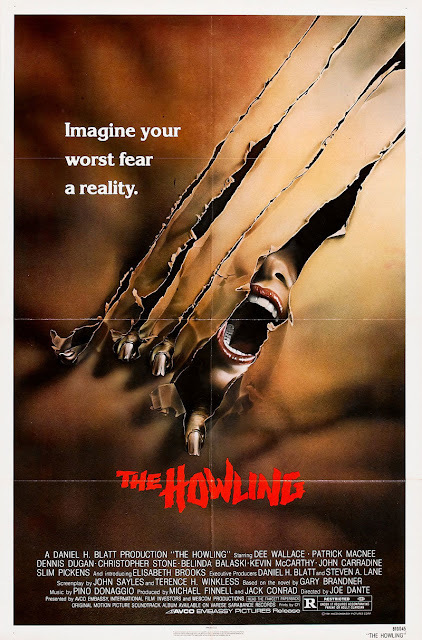 It's a little unfortunate "The Howling" was so massively overshadowed by "An American Werewolf in London" because it is a very solid werewolf flick. It has some tremendously good makeup work and special effects in its own right. Of the two, this movie is more horror-driven, mostly trying for a spine-chilling tone, tension, and plenty of gore. It has a pretty cool looking transformation scene towards the end of the flick, and we actually prefer the design of the fully-formed giant bipedal werewolves here as opposed to the quadrupedal werewolf seen in the John Landis feature. The lycanthropes here are extremely well designed and very scary looking, offering a traditional werewolf design. Many scenes involve gross blood and gore makeup as well, especially towards the end of the film to go along with the transformation scene. This movie has a lot going for it in terms of horror elements. Its biggest detriment is that it's a bit poorly paced. It is slow to start in the early portion of the film. Luckily, we like the lead actors here and think Dee Wallace and Christopher Stone offer good performances, so whenever we're feeling a lull in horror, their performances still keep us entertained. Unfortunately, many of the actors in the supporting cast have wild, cheesy, over the top performances, which makes for a jarring tone at times. We also like some of the themes "The Howling" deals with and we think the ending provides an interesting way to wrap it all up. The way many other characters react to the climax also says a lot about society as a whole (but we won't go into too much detail, you'll just have to see it for yourself). Despite numerous other lycanthrope-related options from 1981, "The Howling" is a werewolf feature that's still worth your time.